The 2013 fiscal year has already produced over $31 billion in awards for South Carolina contractors registered in System for Award Management, spread out over 20,997 transactions. New federal contracting opportunities are opening up for registered contractors in the state of South Carolina. There are currently 269 contracts located in the state and available for bid on the federal government’s official database for procurement opportunities, FedBizOpps. The 2013 fiscal year has already produced over $31 billion in awards for South Carolina contractors registered in System for Award Management, spread out over 20,997 transactions. As the fiscal year comes to a close and federal agencies scramble to spend their budgets, now is a great time for businesses to get registered to bid on available federal contracts. Over the last 5 years, the federal government has spent around $540 billion each year towards government contract awards, according to data on the USA Spending website. As the fiscal year closes, many procurement officers rush to spend the last of their budgets. This makes August and September an excellent time for contractors to search for and bid on new contracting opportunities. However, in order for businesses to participate in federal contracting, they must first be registered. This involves obtaining a DUNS number and registering their information in the System for Award Management(SAM). Unfortunately, many business owners find the registration process complicated and time consuming. Even contractors already familiar with federal acquisition regulations may experience difficulty navigating the required websites and accurately reporting their company’s data. For firms who are completely new to government contracting, keeping up with the jargon and laws associated with government contracting can pose a challenge. 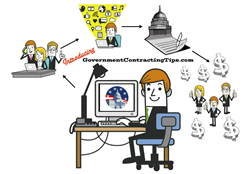 US Federal Contractor Registration is a third party registration firm that has helped thousands of businesses complete their registration and bid on contracts. US Federal Contractor Registration pairs businesses with a dedicated case manager who helps them every step of the way, from initial registration to bidding on contracts. To request a free evaluation and assessment by a Placement Specialist for your business, call the Contractor Helpline at (877) 252-2700 ext 1 or visit our website at https://www.uscontractorregistration.com/.